Are you sure 3V Fashion House PG For Women is closed down? 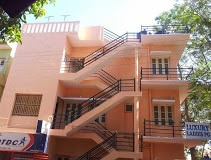 3V Fashion House PG For Women is listed in revaalo under Paying Guests from Bangalore. Reviews, Ratings, contact details, services: . Rooms are very small and the PG is in bad condition. It was a horrible experience staying there. all fake promises. He is giving & supplying dru..s in the PG. His wife vidhya mahesh is also involved. I came here for study and found all dirty things here and complained in police station of j p nagar. the lady inspector arranged everything for me sent me safely back at my home before i could have lost my life and character by staying over there in 3V PG Fashion House. SHARATH KUMAR N This is horrible ! lost my life and character by staying over there in 3V PG Fashion House. You will have a very bad experience and see a greedy owner in this place. "luxury" in its name does not suit this place at all. Its a below average PG with high cost. They have very small room and very less bathrooms. Not recommended at all! not worth the praise. I stayed here for 2 months and moved out. Hello, I am working in Bangalore, the support of this PG is great flawless & clean, and food additionally like home food what they give, extremely quiet environment.